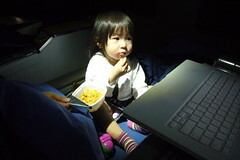 14 hours of bliss… Eating snacks, quietly watching videos, and some long naps made the flight zoom by. Flying ANA is the only way to go for these long international flights. Japanese carriers still understand the meaning of service. The flight crew both going to Chicago and returning from NY have made the trek as bearable as it can be. Thanks again ANA staff!